I want to first apologize in advance for the qualities of the scans in this post, as they leave something to be desired. I've already put all of the cards away in the collection, or else I'd take new ones to replace these. I scanned and saved the cards the same way that I always have, and hope it was just operator error, and not a problem with my scanner. Now, on to the cards! 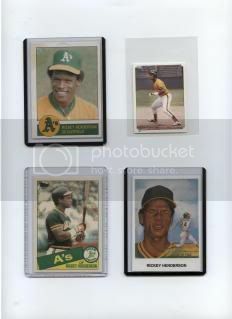 Up until a recent trade, the only years in which I had all of the Beckett recognized Rickey Henderson cards that were produced, were 1979 and 1980, when he only had one card released each year. 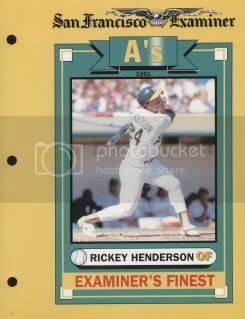 But, thanks to a recent trade/sale with Ken, a fellow Rickey collector, I was able to finish off not one, not two, but three different years! The first card in the scan above is the 1981 Granny Goose #35, which has been on my want list for quite awhile. I remember eyeing this card numerous times at card shows in the late 1980's, but it was always way out of my price range, and now it's all mine. It was also the last Beckett listed card from 1981 that I needed (I now have 15 of 15), resulting in my first completed year! The next two cards were also important additions to the collection, with the 1984 O-Pee-Chee Sticker #327 and the 1985 Topps Tiffany #115 both completing their respective years. I'm now 39/39 in 1984 cards and 26/26 in 1985. 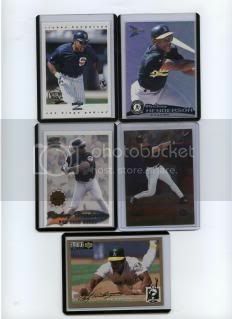 Plus, I now have all 19 of the Topps Tiffany cards produced, as well as all 27 of the listed O-Pee-Chee Stickers. It was definitely a very satisfying trade for the completist in me! The final cards is one that I didn't even know existed until recently. It's a promotional card put out by Z-Silk in regards to their postal cachets. There's no year listed, but based on it's design, and the cachets that they actually produced, I'm thinking that's it's probably from the 1990-1992 time period. This next "card" is the 1987 Sportsflics Superstar Disc #14. I had never seen one of these until around a year ago, and based on the pictures, I'd always assumed that they were similar to the 7-11 discs that were also produced. But, when I received it, I was pretty surprised to learn that it was huge! The 7-11 discs are only about 1 1/2" across, while these discs are about 4 1/2" across, which due to not having a reference point in the pictures that I'd seen, I had no idea about. 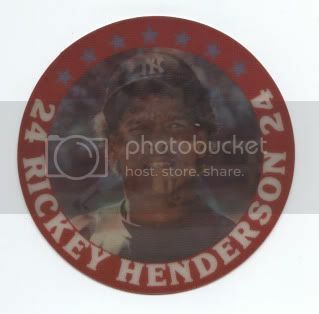 This disc was also an important addition to the collection, as it was card 55 of 55 to complete the 1987 Beckett list. This year holds even more importance than the others, as it's the year that I got my first Rickey, and started collecting baseball cards. I'm not sure where they were sold, but I definitely never saw any of these lying around back then! 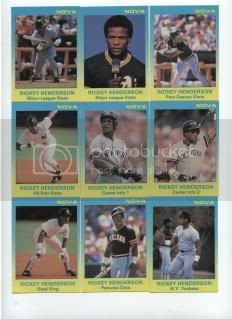 Next we have the 9-card 1988 Star Nova set (limited to 500 sets), the earliest of the Star sets in which Rickey was included. 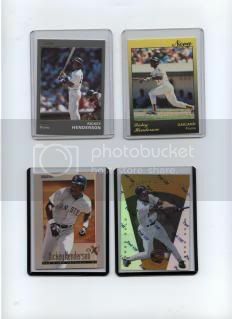 There were a total of 11 Star sets featuring Rickey, produced between 1988 and 1991. And as would be expected based on the pattern of this post, I finally have all 11 of them. Beckett only lists the base 1990 and 1991 sets in their checklist, and excludes all of the other versions (Nova, Gold, Silver, etc.). So, that's an additional 80 cards or so which are not listed on the main Beckett checklist. This next "card" is one that was listed on the Beckett checklist, but until a year or so ago, I wasn't exactly sure what it was. The card is about 8 1/2" x 11", and was an insert inside copies of the San Francisco Examiner. I'm always curious as to why Beckett decided to include really oddball items like this one in their checklist, but more mainstream issues have been left off. I've e-mailed them a few times to ask similar questions, but I've never received a response. The top two cards are Promo cards from the Star sets discussed above, with each set getting its own Promo card. These are the only two that I currently have, with the 1990 Star Gold Promo (print run of 300) on the left, and the 1991 Star Nova Promo (print run of 100) on the right. The second row of cards features two parallels that I've been chasing for awhile. On the left is the 1997 E-X 2000 Credential (#/299), with the 1997 Pinnacle Certified Mirror Gold on the right. Last but not least is 5 more parallel cards, with the first and last ones being my favorite of this lot. The first card shown is the 1997 Score White Border Artist proof, the last of the Score Artist Proofs that I needed. This is followed by the 1999 Pacific Prism Mirror Blue (#/80), and then the 1999 Pacific Paramount Opening Day (#/74). Pacific went crazy with their parallels during this time period, and it's always nice to cross a few off the list. We next have a 2000 Stadium Club One of a Kind (#/150) which didn't scan very well (even worse than the others), but looks much nicer in person. Finally, we have 1994 Collectors Choice Gold Signature #510, which as might have been expected, is the final Collector's Choice Gold Signature that I needed. Overall, I was able to 24 cards to my collection via this trade, almost all of which I've been chasing down for quite some time now. So, I can finally cross all of these off my "priority" want list, but there's still plenty more to take their place. And the search continues!